When we started bird watching, back in 2004, we love to watch flamingos. We often visited Thol to watch flamingos. Whenever we got the news of flamingo-flock nearby Ahmedabad, we try to go there. After starting bird photography, we heard a lot about Khadir bet. Khadir bet is a small isolated place within the salt plains of ' Great Rann of Kachchh'. After monsoon, this place becomes island as the water completely surrounds it. Saltwater area is so vast that we can have a sea like vision up to horizon. During this season Khadir bet also becomes home of Lesser Flamingos. They gathered here in great number, in flocks of hundreds to thousands. Many of our fellow birders visited Khadir bet and saw too many Lesser Flamingos. We desperately want to visit Khadir bet but due to shortage of time, we reach there little late at October end. We saw many raptors and other birds in Khadir bet but missing Lesser Flamingos in morning. Therefore, we hope solemnly that maybe we can see them at evening while returning. We went to visit famous excavation site of Dholavira, an ancient metropolitan Harappan city, and locally known as 'Kotada Timba’- the site contains ruins of an ancient Indus Valley Civilization. We also visited archaeological museum –Fossil Park. Everywhere we only get glimpses of flamingos in small flocks. At evening, we returned to probable flamingo gathering place but our hope was just a vain hope. Again, we saw scattered flocks of Greater Flamingos but not Lesser Flamingos, which we expect. We just set there somewhat disappointed, watching other birds and listen to the chirping of Blue chick bee-eaters. 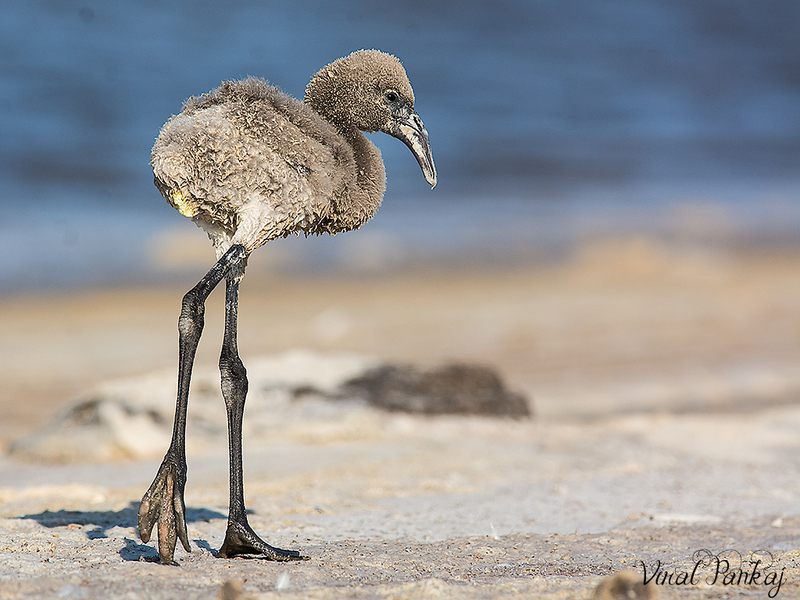 While observing we suddenly locate one flamingo juvenile already started to walk towards us from shallow saltwater. Its behaviour surprised us a lot….! Why this chick is came towards us? We sat still with minimum movements. Its came to shore, saw us, go back into the water, and again come back to shore. It came very close to us apparently unaware of human proximity. Than after few minutes break its started to walk at water's edge. After seeing single juvenile, we are very surprised. We have many questions in our mind. Why there is a single chick? Why its parents left chick? Is it fallen back from flock- crèche due to weakness? etc. It was shivering from cold wind, not looking in condition of feed by itself. We leave the place and prey god that may it can survive in such a tuff condition.